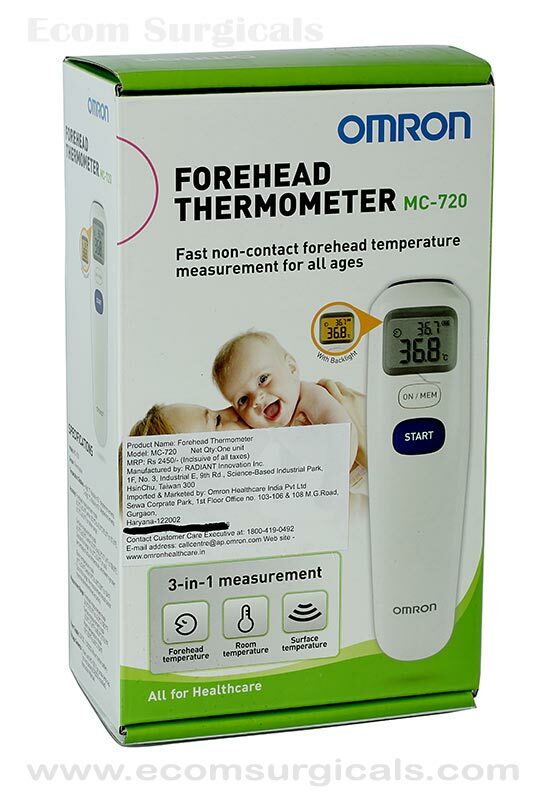 The Omron MC 720 Non-Contact Forehead Thermometer provides numerous features for ease-of-use, convenience, economy, and precision measurement. Have you struggled with taking your child’s body temperature safely and conveniently? Think of how easy it would be if you could just hover over their forehead without even touching them, and really trust the result. With the Omron Forehead Thermometer, now you can. This Omron Thermometer provides a back light as well as a silent mode, allowing you to read your child’s temperature at night without awakening them or others. You’ll want to know if your loved one’s temperature is going up, down, or staying the same. This thermometer provides the last reading and the current reading in the same display, as well as retaining the last 25 temperature measurements. What if the room is too hot, or too cold? What if their milk or soup is too hot? The Omron has covered you. It can be used for these temperature readings as well. 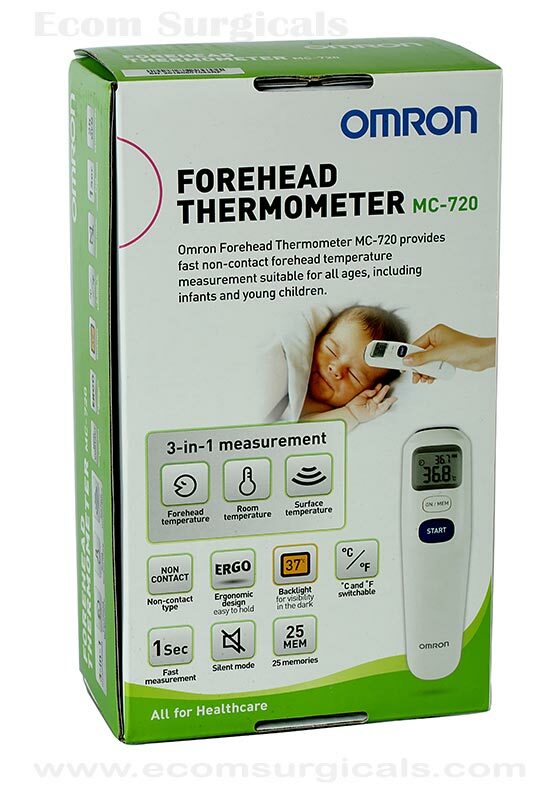 The benefits of the Omron MC 720 Non-Contact Forehead Thermometer are many. Omron MC-720 provides a safe, fast, comfortable means of taking anyone’s temperature, night or day. Also it has multiple purposes, giving you the ability to measure temperate in a room, of an object or of yourself or your loved ones. After switching off, room temperature will remain on the screen. It gives you the means of comparing temperatures, and seeing temperature measurements over time. Hence it is a fast, accurate, and precision instrument. How to take a forehead reading? Make sure the lens is clean and undamaged. Also wipe the forehead clean of cosmetics or heavy sweat, if present. Wait 30 minutes after a bath or heavy exercise. Press START and wait 1 second. Check reading. It is also advised to take three measurements, selecting the highest one if they differ. Make sure the lens is clean and undamaged. Also remove the probe lens cap. Hold the unit with the probe lens close to the object – approximately 1 cm. Check reading. Also display lights up for 5 seconds. Press ON/MEM until “OFF appears. Converts forehead temperature to the equivalent oral reading. The previous and current reading show on the same display. The previous 25 temperatures are retained in memory. Back light for nighttime temperatures. Also measurements take only 1 second. Toggled Silent Mode or convenient buzzer. Automatic power off, hence energy-saving. Also you can measure room temperature and object temperature with one precision device. You can choose Celsius or Fahrenheit. Comfortable, gentle, and easy to use. Also it is safe. 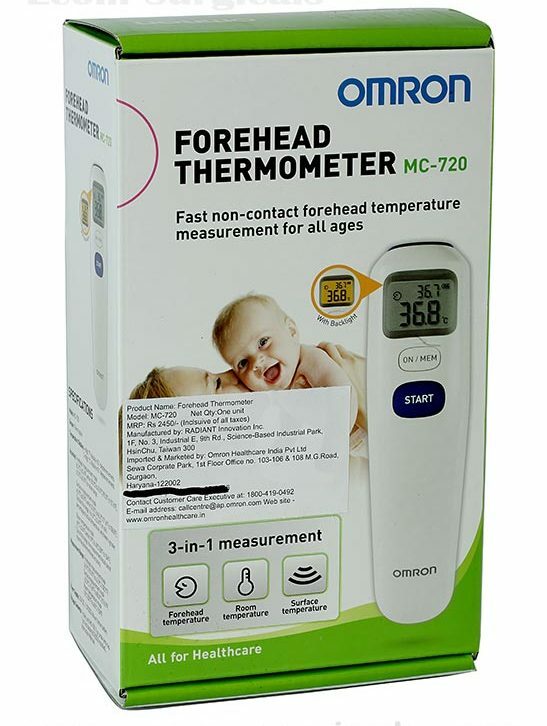 Whether you have a family, or want an easy, stress-free way of monitoring your own temperature, you cannot find an easier, safer, and more comfortable device than the Omron MC 720 Non-Contact Forehead Thermometer. Also no more putting a thermometer under your tongue, under your arm, in your ear, or sliding it across your forehead over and over. You don’t have to wonder what your last temperature was, or if your beverage is too hot or your room is too cold. This thermometer does it all, in only 1 second. Hence don’t hesitate! Buy one today. Thank you for sending the product as per the time frame and i got this item cheaper than other site. I have been long looking for contactless thermometer, especially after seeing it at the clinic of my family doctor. It is never an easy job to disinfect, keep the home thermometer clean enough. It is always worrisome that seasonal flu may affect my whole family just due to the thermometer. If honestly, I was not ready to pay the required price, but here I could find something accurate, affordable, and yet of good quality. I am really satisfied with the product. Thanks to supplier for prompt supply. 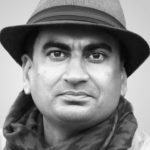 Hats off, no complains with product. I bought this for my baby and it is worth for the money. I am little bit concerned about the battery life as it will not switch off and room temperature will be displaying always after the measurement. This thermometer is very useful for kids. I prefer ed this because it is hygienic as there is no body contact. Can be used for multiple users too. Good deal. Quick delivery to London. Everything fine with the order. Got the proper invoice and warranty card too. Very cute thermometer. Back light not able to off. Hence little worried about the life of battery. Otherwise everything ok. Very nice buying experience from this online store. The thermometer which I got is brand new and working fine.